Industrial Dyes are used in Laundries, Prisons, Hospitals, Industrial sites or anywhere that large quantities of clothing (Uniforms), rags, towels, or whatever need to be colored or color coded. Just toss the dissolvable dye pack into the hot washing machine with the goods to be dyed, no measuring needed! This dye is a quick cheap easy dye. Don't expect it to give you professional results like Dharma Fiber Reactive dye on cellulose fabrics, or Dharma Acid Dye on protein fabrics do. For industrial dye for polyester, go here. These dyes are used in Laundries, Prisons, Hospitals, Industrial sites or anywhere that large quantities of cotton, rayon, linen, etc. clothing (like uniforms), rags, towels, or whatever need to be colored or color coded. The water soluble 8 oz. bags (dyes up to 50 lbs of goods) get thrown into HOT water washing machine load for 15 minutes (up to 30 minutes) and then rinsed and washed. The hotter the water you use, the better the color you will get. Wash out excess dye with Synthrapol or laundry detergent and hot water. That's it! Use 1 lb. per 100 lbs. of fabric. No mess, no fuss, no brainer! The Black dye works great for returning black clothes to their original blackness. Use with our Dharma Dye Fixative to boost color retention. The results are not as long-term, washfast or as bright as our other dyes, but these are easy & cheap. If you want a professional good looking dye job on your clothes that will last and last, use our Dharma Fiber reactive dye for cellulose fibers (cotton, rayon, hemp, etc.) or our Acid Dyes for wool and silk. **We also have Industrial dyes for polyester! - see the related product below. Can be combined with these dyes for natural fabrics to dye fabrics that are polyester blends darker shades. The Polyester dyes are in the same colors as these dyes. We were building a Halloween haunted trail for a fundraiser--on a shoestring budget. A hotel donated about 40 sheets and I needed them to be--not white. I didn't need a level color and the color didn't have to last. I just needed a lot of cheap-a$$ dye. I figured that Dharma carries everything dye so I looked and sure enough! One pound of black dye colored my 40 sheets various shades of grey--which is what I wanted.This stuff is what it is. If you want a high-quality dye job go for the acid or fiber-reactive dyes. If you just need to get some color onto somethingcheap this stuff works. The dye did an excellent job. The coloring for the large amount of material was even. Clean up was easy with no mess. Best of all the project was completed at a very reasonable cost. I use the black dye to blacken all my black faded clothing every few months. 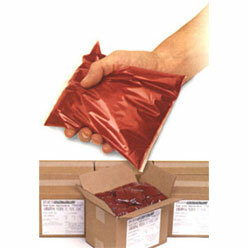 I used two bags of "red" to dye 200 yards of cambric (weighing a total of no more than 20 pounds). It came out cotton candy pink. Black isn't even close. This is definitely blue. I was hoping for a grey and I got a light blue completely ruined my project. Never again. I ordered the orange dye. It was a pretty simple process and I followed the directions perfectly and everything I dyed turned out PINK. Do not use this dye if you want orange. NOT AS GOOD AS I HOPED IT WOULD BE- I WILL TRY ANOTHER DYE. I used two packets to re-blacken a large load of laundry. The color came out very black. I was psyched. But it washed out the next time the garments were washed. i won't buy it again. I am also concerned about the toxicity of it. My package arrived very quickly and the dyed fabric looks great! The packages arrived very quickly and the dye looked great!